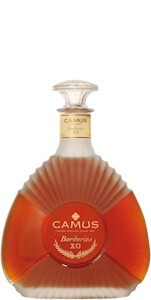 Cognac Brandy by Camus of Cognac, Brandy. Undertones of hazelnut and notes of vanilla. The only single Cru of it's kind, made entirely of aged stocks from Jean Paul Camus own vineyards in the superlative Borderies district, itself known for producing the rarest and most aromatic Cognacs. . Mild oak tones with hints of spiciness.